For its size and nature this is the largest project of its kind developed by the Peruvian State . It is the first time that national and professional technicians perform multidisciplinary research that links the past, present and future of Peruvian society under the management of the territory. This exceptional work of the Andean world is a set of development projects that aim to promote improvements in the quality of life of the people associated with the path , through research , conservation and social value of cultural events linked to Qhapac Ñan. The project is implemented through the Regional Culture Directorate of Cusco for all the stretchs that are included in the same region and through the National Headquarters of the Ministry of Culture for all other stretchs in other regions of the country. Recovering and preserving the road network and sites related to Qhapac Ñan, revealing its importance as an economic, social, cultural and linkage work with various peoples of pre-Hispanic Andean area, aiming current contribuition to development of peoples associated with the path, from the revaluation of assets, the organized management of the territories for wich it cross and participation of the community and citizen in a management processes. 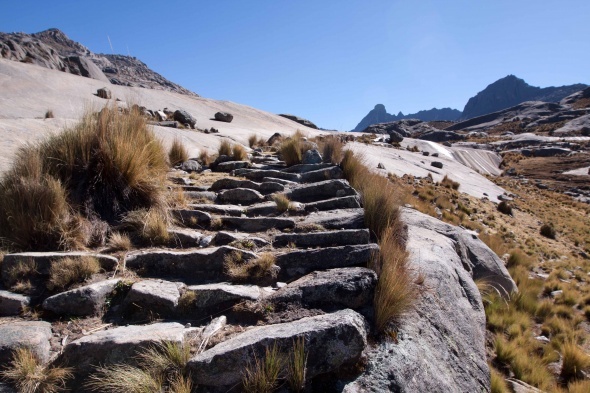 The term Qhapac Ñan in Quechua means "Great Inca Trail". The Qhapac Ñan is a road system formed on the basis of a network of roads, strategically placed to cover the full extent Andean geography. It is at the same time, historical expression of the expansion of the Inca Empire in the fifteenth century. This road network is the product of the accumulation of multiple experiences over centuries of Andean history. In fact, it is known that different Andean peoples traced trails and routes that the Incas later incorporated and articulated to their own road system. The most impressive achievement of this development was the organizational capacity of the roads as a single articulated system of continental dimensions. Qhapac Ñan routes spanning territories of the current countries of Peru, Ecuador, Colombia, Argentina, Bolivia and Chile. The Peru conceives Qhapac Ñan as part of its cultural policy and considers that this heritage asset is established as an opportunity for integration, development and cultural identity for the populations along the Qhapac Ñan . Aware of the immense tangible and intangible cultural value of Qhapac Ñan, which is based primarily on its transregional integrative function and its physical and functional effect , the Government of Peru , through the Ministry of Culture, from 2001 promotes the multinational initiative for registration of Qhapac Ñan - Andean Highway System in the list of World Heritage initiative which was subsequently supported by the representations of Argentina , Bolivia , Colombia , Chile and Ecuador, adhering to the subscription and starting a unprecedented pioneering integrator insight work that will become a milestone for all processes of the UNESCO declaration . On February 1, 2013 , the Permanent Representatives to UNESCO of the six countries (Peru , Colombia , Ecuador , Chile, Bolivia and Argentina) that comprise the system Qhapac Ñan, presented the nomination dossier of the Andean Road System to the World Heritage List. Currently the technical teams of the six countries are developing the Management Plan of the nominated stretch. This document consists of strategic guidelines, a conservation plan and agreed action plan, to ensure its sustainability and ensures adequate response to the needs of communities and the peoples linked to Andean road system. The Ministry of Cultures developed Work shops over design and management of communitarian cultural and experience exchanges to enhance the work of local and cultural organizations.